You have to be ready for puns galore when you read Shiny Pippin so probably have to be a fairly competent reader. The story is about Pippin who discovers she has a magical gift as does her Gran who she admires. She can ‘shine’. This means she can talk to her special animal partner, her pet mouse, Tony - for His Dark Materials fans a little like a Daemon. 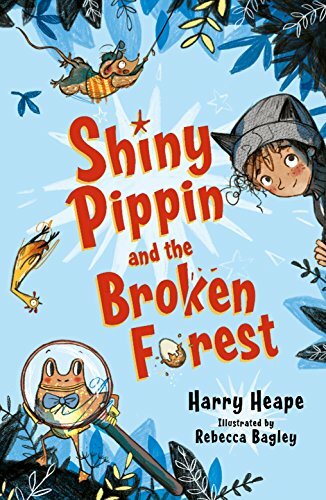 Pippin is tasked with finding out what is going wrong in the forest - the water is disappearing and there are strange goings on there which seem to be linked to a sinister laboratory nearby. Pippin and Tony are captured by the ‘baddie’ penguin-Count Visbeck. This is fairly unusual in a story as normally penguins seem to be the good guys…. She then meets some helpful characters along the way including a very talented frog who everybody could do with as a friend for getting you out of tight spots. She learns how to use her magic super power properly and the mystery of the disappearing animals and dying forest is solved. As I said you do need to be a good reader or read this story together with your child to keep up with the play on language and also some of the more grown up links like the James Bond characters. It has a lot of jokes in which are funny but can make the story harder to just keep hold of because of so many ‘asides’. Although it is a fairly thick book the text has a lot of space around it so it is not too dense to put children off. It also has plenty of comical illustrations which add to the fun.